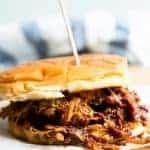 Perfect Slow Cooker Pulled Pork. This Texas style pulled pork is made easier in the slow cooker. Perfect for enjoying as a BBQ Pulled Pork Sandwich, or loaded up on nachos, or even as a pizza topping! The possibilities are endless! Mix together the ingredients for the Texas Dry Rub in a small bowl. Trim off any large excessive fat pieces from the pork roast. Rub the pork shoulder with the Texas Dry Rub on all sides. Place into the slow cooker. Stir together the apple cider vinegar, worcestshire sauce, and liquid smoke in a small bowl, then pour over the pork roast in the slow cooker. Cook on Low heat for 8 hours until tender. Remove the pork from the slow cooker and shred using forks. Spread the shredded pork over a large baking sheet lined with foil. Pour the remaining juice from the slow cooker over the meat. Remove from oven, allow to cool for a couple minutes. Serve warm on hamburger buns, top with Texas Style BBQ Sauce! Or some Blue Cheese Coleslaw. Enjoy!